I recently cooked dinner for my gang of friends, which I LOVE to do. It gives me a chance to have everyone over to my place for a nice visit, and I get to try out a few new food ideas. Most times, there's a theme, and this time was no different. Our theme was your basic summer type foods, with an emphasis on Jersey Fresh produce (of which I simply cannot possibly get enough). We had the best corn on the cob in the world, we had a lovely salad of roasted summer squash with tomatoes and a basil vinaigrette, and of course I made my Mom's famous potato salad. My main dishes were BBQ pulled chicken sandwiches and this fabulous chili dog casserole. TBH, I can even remember where I got the idea for it. I think I was just trying to think of different cookout foods. For me, that would normally mean hamburgers and hot dogs, but I live on a 3rd floor apt, so there's no way to grill anything. Then I thought, well, what about a casserole???? A quick google search and there it was. Clearly I was not the first person to think of making chili dogs into a casserole! Some recipes used cut up bread in the bottom of the dish with a very thin chili and hot dogs on top. Some used canned chili with hot dogs and biscuits on top. So I gave the latter a try, since I liked the biscuit idea. Omg it was absolutely terrible. I barely added any seasoning to it at all, and it was so salty, I couldn't even eat it! Crazy, right? I literally threw the entire thing away! But I knew that this idea was worth a second go. Of course I yelled at myself for being lazy the first time around. I should've known better than to use canned chili, which was just not gonna cut it in this particular dish. So then I started looking up recipes for "hot dog" chili. I saw a few that looked pretty good, but then I thought "Wait, what am I doing? Do I really need a recipe to make chili?" Absolutely not. I mean, yes, there are a million different ways of making chili, but I knew I would wind up changing the recipe to make it that way I like it anyway, so I might as well, just do it the way I like it in the first place! My first thought was "beans or no beans?" And my friend Jerry said it ever so eloquently: "chili has beans. MEAT is the thing that is optional." So I said well ok then! To quote Stephen Sondheim: "If the end is right, it justifies the beans!" Luckily I remembered to write everything down as I was cooking, and this was absolutely the recipe I had been looking for. THIS is the reason why I always make something home made instead of using canned. THIS is the reason why people always say "of course you did" when I say that I made something from scratch. And THIS is the reason why I always say "It's better when YOU make it." There's just no comparison! Not only does it feed a big crowd but it also clicks a lot of other boxes as well. It's easy to make, can be made in advance, and it's just as perfect for your summer barbecue as it is for when you have everyone over to watch your big game. So I hope you'll give this one a try. I'm really REALLY pleased with how it turned out. If you like chili dogs, you will definitely love it! In a large deep skillet, brown ground beef. Be sure to break up any large clumps. Add onions. Saute for a few more minutes. Add remaining chili ingredients and give it a good stir. Reduce heat to low and let it simmer for about 15 minutes. Slice hot dogs into bite sized pieces. Add to chili. 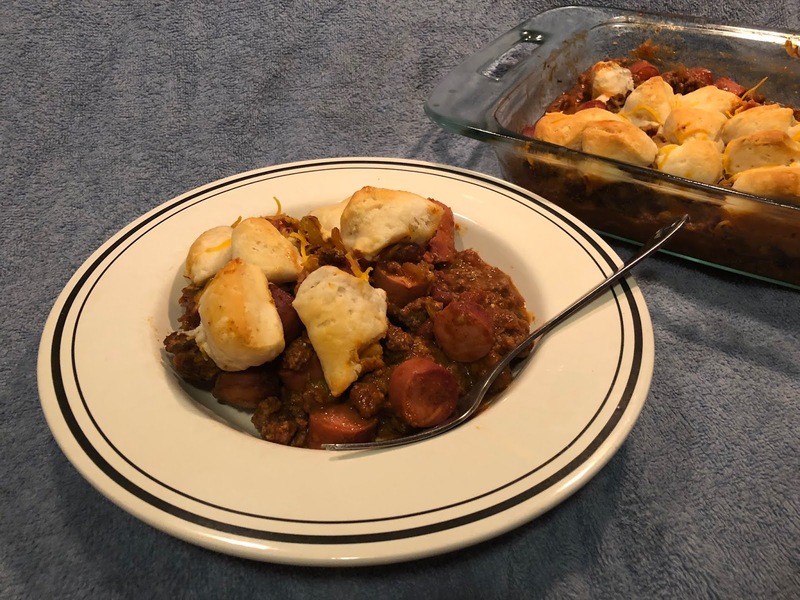 Pour hot dogs and chili into a 9x13 casserole dish. Place in oven, and bake, (uncovered) for about 30 minutes until bubbly. Sprinkle with shredded Cheddar cheese. Open the can of biscuit dough. Cut each biscuit in half, and then cut each half into thirds. Place biscuit pieces all over the top of the casserole. Place the casserole back in the oven and bake unto biscuits are lightly golden and cooked through. The key to this recipe is You do you! Add the Tabasco to your own taste. (How much heat would you like?) If you like more cheese, go for it! Also feel free to add a different kind of beans or omit them if they're not your thing. Don't like hot dogs? Just make it a chili casserole with biscuits on top! That would still be delish! If you want to stretch this meal even further, go ahead and add a few more hot dogs to the casserole. I used the 8 that were in the package, but you can easily add as many as 12 if you have more mouths to feed. Btw, the reason I heat the casserole first without cheese or biscuits is just to make sure it's hot and bubbly before the biscuits are put on top. This serves two purposes: it makes sure your biscuits and cheese don't get too brown before the casserole is cooked through, and it also makes sure that the underside of the biscuits will cook properly. No one likes soggy biscuits!